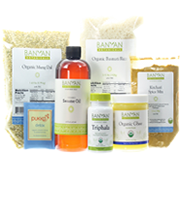 This kit provides the basic supplies you need to do a 7 day cleanse at home. It comes with instructions. The shipping box weighs ten pounds so try not to be shocked at check out. Ingredients: Organic Yellow Mung Dal (1.63 lbs), Organic Basmati Rice (3.15 lbs), Kitchari Spice Mix (3.5 oz), Organic Ghee (7.5 oz), Triphala Tablets (1 bottle), Organic Sesame Oil (16 fl oz bottle), and Pukka Detox Tea. Ingredients: Bilva root (Aegle marmelos), Agnimantha root (Premna integrifolia), Shyonaka root (Oroxylum indicum), Patala root (Stereospermym suaveolens), Kashmari root (Gmelina arborea), Bruhati root (Solanum indicum), Kantakari root (Solanum xanthocarpum), Shalaparni root (Desmodium gangeticum), Prushniparni root (Uraria picta), Gokshura root (Tribulus terrestris). Detox is a general organ cleanser and tonic that addresses the kidneys, liver, pancreas, and gall bladder. It helps restore the body after damage from toxic metals, alcohol, and nutritional deficiencies. Vadik is so confident of this product that it guarantees that if you do not see results, you can return the empty bottle for a complete refund. Ingredients: standardized extracts of Amalaki, Emblica officinalis; Manjistha, Rubia cordifolia; Turmeric, Curcuma longa; Guduchi, Tinospora cordifolia; Anantmul, Hemidesmus indicus; Vidanga, Emblia ribes; Licorice, Glycyrrhiza glabra. Kaishore Guggulu is a pitta reducing formula. It supports removal of toxins and relief of inflammation, especially in the joints and muscles. In Ayurveda, this formula is used for pitta conditions where there is sharp pain, such as with arthritis and bursitis. It is cooling and can be used in conditions in which there is redness and irritation. Ingredients: Guggulu resin, Commiphora mukul; Guduchi herb, Tinospora cordifolia; Ginger root, Zingiber officinale; Pippali fruit, Piper longum; Black Pepper fruit, Piper nigrum; Danti root, Baliospermum montanum; Nishoth root, Operculina turpethum; Amalaki fruit, Emblica officinalis; Bibhitaki fruit, Terminalia belerica; Haritaki fruit, Terminalia chebula. This rejuvenating Liver Formula gently resolves excess pitta and strengthens the liver through detoxification. Toxins associated with substance abuse, poor dietary choices and metabolic imbalances, as well as pollution are gradually reduced. Ingredients: Guduchi herb, Tinospora cordifolia; Bhumy Amalaki herb, Phyllanthus fraternus; Kutki root, Picrorhiza kurroa; Amalaki fruit, Emblica officinalis; Chitrak root, Plumbago zeylanica; Punarnava root, Boerhaavia diffusa; Vidanga herb, Embelia ribes; Manjista root, Rubia cordifolia; Haritaki fruit, Terminalia chebula; Bibhitaki fruit, Terminalia belerica; Coriander seed, Coriandrum sativum; Dandelion root, Taraxacum officinale; Musta root, Cyperus rotundus; Cilantro leaf, Coriandrum sativum; Guggulu resin, Commiphora mukul; reduced iron, Anantamul root, Hemidesmus indicus; Licorice root, Glycyrrhiza glabra; Pippali fruit, Piper longum. Liver Tune Up, 4 oz. Most liver cleansing formulas are very bitter and cold, but this one has some warming herbs to help digestion and promote detoxification simultaneously. It is intended for relatively long-term use, at least two months but those who have been exposed to more liver insults may find that they want to continue for 4-6 months or even a year. Ingredients: proprietary blend of Milk Thistle seeds, Ginger root, Dandelion root, Yellow Gentian root, Fennel seed, Licorice root, Turmeric root, Bupleurum root in organic cane alcohol, distilled water, and vegetable glycerin. Neem is an exceedingly detoxifying herb that is especially valuable in removing excess pitta and kapha. It is very bitter and cooling. Vata types can combine neem with some warming herbs to offset its cooling effects. Neem is used to purify the blood, cleanse the liver, and boost immunity. Ingredients: Neem leaf, Azadirachta indica*. Ingredients: Guggulu resin, Commiphora mukul; Amalaki fruit, Emblica officinalis; Bibhitaki fruit, Terminalia belerica; Haritaki fruit, Terminalia chebula; Gandhak, Castor oil, Ricinus communis; reduced iron. Stone Breaker Extract, 2 oz. Phyllanthus amarus in known in South America as "chanca piedra" or breaker of stones. There, it is used mainly for kidney stones but also for gall stones and many other disorders ranging from malaria to liver cancer. In Ayurvedic medicine Phyllanthus amarus is known as bhumi amalaki. It is revered as a major detoxifying and liver rejuvenative herb. It is recommended that it be used in small amounts over a long period of time. Modern studies support traditional uses and suggest that Phyllanthus amarus prevents mutation of liver cells when exposed to carcinogens. Ingredients: Phyllanthus amarus leaf extract, 1:3, in Distilled Water, Organic Alcohol, and Vegetable Glycerin. Sweet Ease promotes healthy blood glucose levels. Contains bitter and astringent herbs that work synergistically to alleviate excess kapha. Sweet Ease promotes proper function of the pancreas and may be useful for people prone to high blood sugar. Clinical studies suggest that the two main herbs in Sweet Ease, shardunika and neem, promote insulin secretion. This formula helps to purify the blood by supporting proper digestion and metabolism. It can be used by both pitta and kapha types but may aggravate vata. Ingredients: Guduchi herb, Tinospora cordifolia; Amalaki fruit, Emblica officinalis; Shardunika leaf, Gymnema sylvestre, Turmeric root, Curcuma longa; Kutki root, Picrorhiza kurroa; Neem leaf Azadirachta indica; mineral pitch. Ingredients: Anantamool, Hemidesmus indicus, Guduchi, Tinospora cordifolia, Haritaki, Terminalia chebula, Kachur, Curcuma zedoaria, Licorice, Glycyrrhiza glabra, Manjishta, Rubia cordifolia, Turmeric, Curcuma longa, Galangal, Alpinia galangal, Kutki, Picrorhiza kurroa, Organic Alcohol, Vegetable Glycerin, and Essential Oil of Lemon. Ingredients: Proprietary Blend: Amalaki Fruit (Emblica officianalis, Haritaki Fruit (Terminalia chebula), and Bibhitaki Fruit (Terminalia belirica) in Organic Alcohol, Distilled Water, and Vegetable Glycerin. Ingredients: standardized extracts of Terminalia belerica, Terminalia chebula, Emblica officinalis, Cassia angustifolia. Yogaraj Guggulu is a traditional formula for reducing vata. It is often used to ease problems involving the muscles and joints, especially where there are spasms, tremors, dryness, and sensitivity to cold. This formula aids removal of toxins from the neuromuscular system and joints. Ingredients: Guggulu resin, Commiphora mukul; Musta, Cyperus rotundus; Chitrak, Plumbago zeylanica; Amalaki fruit, Emblica officinalis; Bibhitaki fruit, Terminalia belerica; Haritaki fruit, Terminalia chebula; Pippali fruit and root, Piper longum; Ajowan, Carum copticum; Vidanga herb, Embelia ribes; Gokshura root, Tribulus terrestris; Black Cumin seed, Nigella sativa; Ajamoda, Trachysspermum ammi; Cumin seed, Cuminum cyminum; Deodara herb, Cedrus deodara; Chavya, Piper cubeba; Cardamom seed, Elettaria cardamomum; Rasna herb, Pluchea lanceolata; rock salt, Coriander Seed, Coriandrum sativam; Ginger root, Zingiber officinale; Black Pepper fruit, Piper nigrum; Cinnamon bark, Cinnamomum zeylanica; Ushira, Vetiveria zizanoides; Yavakshar, Hordeum Vulgare; Talispatra leaf, Abbies webbiana; Tejpatra, Cinnamomum tamala.